LOGITECH Australia has launched a new universal remote control designed specifically for people buying complicated HDTVs and personal video recorders (PVRs). With a large colour display, the Harmony 880 advanced remote control offers enhanced navigation that simplifies the use of these modern home-entertainment systems. “People buying a high-definition TV today are likely to be frustrated by all the adjustments they have to make every time they simply want to switch from watching a TV program to watching a DVD,” said general manager of Logitech Australia, Marco Manera. Maintaining the same comfort-grip design as previous models of Harmony remotes, the 880 features a crisp colour LCD and finely sculpted buttons that make selecting an activity a breeze. Colourful icons now accompany text on the LCD screen to allow for quick and easy command of home entertainment equipment. The remote is also rechargeable, eliminating the need to change batteries. When the remote is not in use, it rests on an attractive charging platform. The Harmony remote solves a problem prevalent in the modern-day living room - too many complicated remote controls. It has the ability to control any component with an infrared receiver. After an intuitive, Internet-powered setup, any family member or guest can use the remote without guesswork or frustration. Selecting an activity, such as watching a DVD or watching TV, requires pressing just one button. Logitech’s patented Smart State Technology allows the remote to easily control a home entertainment system by knowing how components are connected, the status of each device at any given time and how to direct each component. The colour display has eight buttons, four located on the left and right sides, which together serve as a personalised activity control centre. During setup, background images can be downloaded to fit personal preference. To optimise visual navigation, on-screen icons and text describe specific activities, such as watching TV or listening to music. The remote is fully backlit so it is easy to navigate in the dark. When their eyes are glued to the television, people can find useful buttons effortlessly, by touch. The primary navigation controls, such as play, pause, record and the number buttons, are easily identified by feel due to their varied size, shape and location. 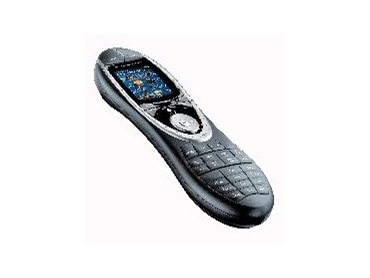 With rechargeable lithium ion batteries, the Harmony 880 remote will never require new batteries. The recharging station provides a home for the remote so that the whole family knows where to put and find it. Powered by patented technology, Harmony remote controls are designed to work the way people think, requiring just one click of a button to initiate a home-entertainment activity. For example, to watch TV on a satellite system with a personal video recorder (PVR), the TV, receiver, satellite and PVR box may all have to be powered up and set to the right inputs. A Harmony remote can send all of the appropriate infrared (IR) commands with one touch. Without the remote, the activity might require pressing 10 or more buttons on several remote controls. By plugging into a USB port, all Harmony remotes are easily programmed through a shared, online database containing information about tens of thousands of home stereo equipment and remote controlled devices. Each customer has their own online home page that details exact setup, which can easily be updated or modified when new equipment is purchased. The Harmony 880 remote control is available at leading electronic retailers throughout Australia.